Folds to just 5 1/4" deep for storage and mobility. Drop keyboard shelf with six height and tilt positions. End caps on legs help protect floor. Holds CPUs up to 19" deep. 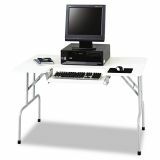 Safco Folding Computer Table, Rectangular, 47 1/2w x 29 3/4d x 28 3/4h, Light Gray - Folding computer table conveniently folds down to 5-1/4 for easy mobility and storage. The 20-3/4" wide x 9-1/2" deep keyboard shelf is height and tilt adjustable into six different positions. Design features folding steel legs with black endcaps and a 3/4" thick laminate top. The 37 lb. 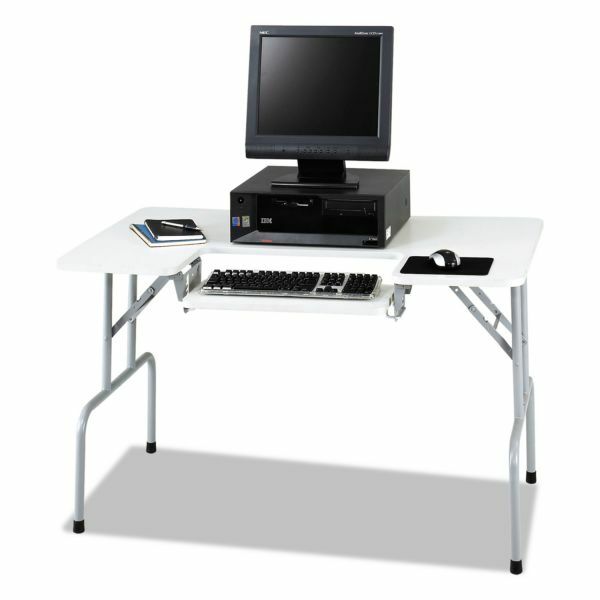 table holds CPUs up to 19" deep and up to 100 lb. evenly distributed."